The Daily Rant: I'm Supposed To Call Who? Yesterday I got an early morning reminder text from a friend. Since we're in different time zones, the text came in to me at 6:27 am. At that time, I had only had four hours of sleep since I drove the night before, and barely managed to tap out a response. With one eye open, still snuggled under the covers, in the fog of the early morning, feeling so tired I was delirious and really couldn't think straight, I also sent myself an email to remind me to make the call. When I woke up a couple of hours later, I checked my phone and this is the email I found in my in-box. 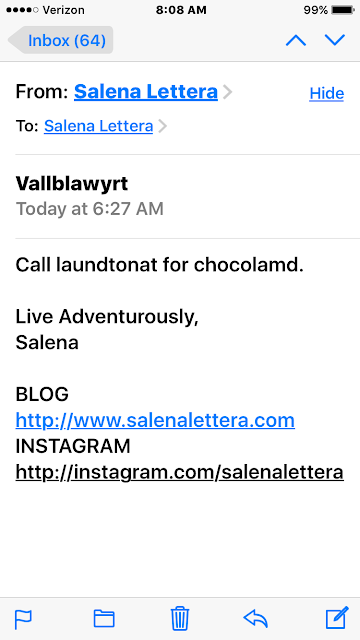 I'm pretty sure the subject line is supposed to say "Call Lawyer", but I have no idea what the hell "Call laundtonat for chocolamd." means. It sounds like it could be something semi-delicious, but I can't be sure. Sleep deprived texting is almost as bad as drunk dialing.